One of the most obvious and frequent mistakes made by beginning quilters when joining rows of blocks is poor alignment. This is especially true when working with sashed blocks and rows that don’t have cornerstones (the squares usually found between block sashing), causing the rows to look crooked (fig. 1). To prevent this from happening, as you line up your sashed rows for sewing be careful to match the sashing seams between blocks on the two rows (fig. 2). 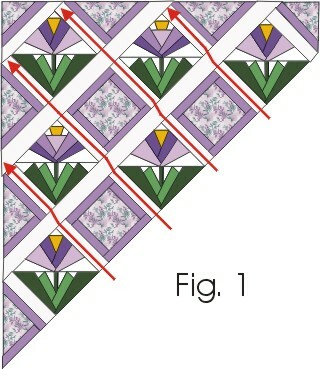 To check before sewing, fold down the top row to make sure sashing pieces are aligned (fig. 3) then pin to secure. This was precisely what I needed. I knew it could be an easy thing; I just needed to have someone else think of it!! Thanks!